After their daughter Maribel suffers a near-fatal accident, the Riveras leave México and come to America. But upon settling at Redwood Apartments, a two-story cinderblock complex just off a highway in Delaware, they discover that Maribel's recovery-the piece of the American Dream on which they've pinned all their hopes-will not be easy. Every task seems to confront them with language, racial, and cultural obstacles. At Redwood also lives Mayor Toro, a high school sophomore whose family arrived from Panamà fifteen years ago. Mayor sees in Maribel something others do not: that beyond her lovely face, and beneath the damage she's sustained, is a gentle, funny, and wise spirit. But as the two grow closer, violence casts a shadow over all their futures in America. Peopled with deeply sympathetic characters, this poignant yet unsentimental tale of young love tells a riveting story of unflinching honesty and humanity that offers a resonant new definition of what it means to be an American. An instant classic is born. 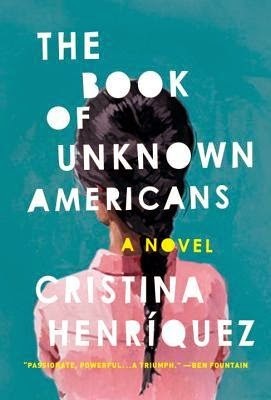 I absolutely adored The Book of Unkown Americans because I found it felt like a true recounting of what immigration is today. People striving to create better lives for themselves and the unfortunate situations they find themselves struggling through in order to attempt to achieve their dreams. The story was very heartbreaking at times but also very honest and true. I liked how the story changed perspectives so you got different takes on what was going on. I think that it often makes a story much richer when you add that depth to it. The book was so engaging that I felt myself wondering more about some of the characters who were less developed and I could even imagine that a follow up story could be told about them. The people had that much of an appeal and draw that I was left wondering about the people it was about long after I had read the last page. Henriquez' novel was full of truths and realities and was often bittersweet to read. The love and care between the family really struck me. I have always thought that immigrants are very brave people as they often move to a country where they speak little, if any, of the language and come to a society that they know not much about. This book helped me to put a face to all those you never stop to truly consider. I recommend this book to absolutely everyone as it was a fantastic read with a very important commentary on modern society. Thank you to Knopf for our review copy. All opinions are our own.